Preview: For those reading this (and that'd be you right now), this post is about more than semantics in calling our sport "soccer" instead of "football". It is about defining our own history with the sport and our own identity within the global game. 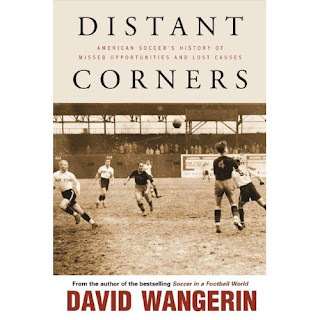 In the last few weeks we've been reading David Wangerin's (author of "Soccer in a Football World") "Distant Corners" which chronicles the emergence of soccer in the United States. Even though we consider ourselves passionate American soccer fans we've found ourseves woefully ignorant on the depth and complexity of the beginnings of the sport here. For many younger soccer fans in America it's easy to assume that our sporting history does not extend much before the 1994 World Cup or the foundation of Major League Soccer in 1996. For those more seasoned veteran fans of the game they can recall the heyday of the North American Soccer League, the New York Cosmos, and a gaggle of foreign stars on our shores. You may even have heard or read a blurb about Joe Gaetjens and the "Miracle on Grass" in 1950 or that the United States somehow managed to field a side in the inaugural 1930 World Cup. The truth is that since the end of the Civil War this sport has slowly, ever slowly, grown. From a game played by a sparse few and fertilized by "hyphenated" Americans to one embraced by all-American squads from New York to Pennsylvania to St. Louis and beyond. From the likes of the "Father of American Soccer" Tom Cahill to the birth of the American Challenge Cup in 1913 (that would later become the Lamar Hunt U.S. Open Cup), American soccer has history. With that being the groundwork for everything written henceforth, the Free Beer Movement declares that we must erase the term "football" from our collective vocabularies and instead replace it with soccer when referring to the game as it's played in America. Before anyone swells up into righteous anger, please hear us out. At the most basical level this is to reduce confusion. Our American nation already has one football and, at this time, is the most popular sport in the country. Continually referring to soccer as football is confusing and ultimately unnecessary. For any of us that have friends, family, and co-workers that tolerate our soccer talk, blending "football" and "football" is at the least confounding and at the most, annoying. We've been prone to referring to "football" as "throwball" and that is most certainly insulting to fans of that game (whether you care about hurting their feelings or not... many of them are potential FBM converts). As cited by an English gentleman, Daryl Grove, on the "Total Soccer Show" countries that have dueling "footballs" often defer to the term "soccer" to avoid confusion. And well, if that's good enough for Australia I don't know why it isn't good enough for us. Semantics aside, though, soccer means something. Despite the fact that "soccer" itself is a Oxford-"er" abbreviation of "association football" that originally evolved in the 1880s, the word "soccer" has taken on a uniquely American identity. Despite the best efforts of many ex-pats in the United States to establish "football" as the prevailing title for the round ball sport emerging in the early 1900s, "football" of the gridiron-persuasion took hold, and as we know in today's Bud Light/NFL world, has not relented since. To use the word "soccer" instead of "football" is to make a greater distinction than just separating ourselves from the pointy-ball version. It is to declare our independence from the "football" of its birth nation, much like we did from its political system over 200 years ago. The bright lights of Old Trafford, Stamford Bridge, and Anfield are alluring, like the Sirens from Greek mythology, crashing our expectations for what this sport should be on their rocky shores. Their sport is football and there's no crime in calling it so, but when referring to the Chicago Fire, it should be as their full name implies, a "Soccer" Club. 1921 American Soccer League season. The first "significant, viable professional league" in the United States even adopted "soccer", the American Soccer League, which lasted from 1921 to 1933, before they fell victim to the Great Depression and political infighting. Despite their failure it was understood that their name be distinctive from both the "American Football" played professionally and on college campuses and "European Football" played overseas. 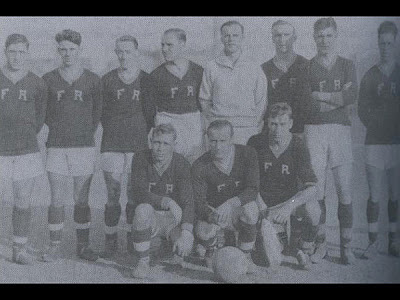 The national federation has, as Wangerin, explains, gone through "a confusing number of name changes, first founding itself as the United States Football Association (until 1945) then the United States Soccer Football Association, and then correcting themselves as the United States Soccer Federation in 1974. A proper name for a proper soccer nation. For better or worse our history has earned us "soccer". From innovative ideas like substitutions (first used in ASL games in 1926) to the less-so, like the 35-yard running shootout of the NASL and early MLS days or running our season contrary to the FIFA calendar and shying away from promotion/relegation, American soccer is unique and deserves a name that attests to that. We're "soccer" in that we embrace the franchise system and playoffs as the rest of our sports do. Our supporters culture is uniquely "soccer" in that, much like our nation's history, the stands are a melting pot (or the more properly and preferably, but less recognized "salad bowl") of diversity. By virtue of years of watching, waiting, and dreaming in the shadows of our other major sports and the global versions of this game we should embrace the word "soccer" as a badge of honor; to indicate the hard fought battles of sporting integration to legitimize a game birthed far away from here. Give credit where credit it due. Football, invented an ocean away, has inspired generations and millions of Americans (and immigrant Americans throughout) today. We can be fans both of the continental game (and other leagues of the world) and our domestic game, but it's time to call a duck a duck and soccer, soccer. We eat cookies, not biscuits. We have fries on the side, not chips. We wear pants, not trousers. We go to the bathroom, not the loo. We've declared our independence from so many other English words. Why not football? For a nation so enamored with "exceptionalism", "leading from the front", and "making the world safe for democracy" we're awfully content to take our cues from our more experienced brethren. We think by now we've gotten what we need from them and it's time to continue our evolution and develop our own, American soccer identity. It's not to say we don't still aspire to the level our continental counterparts, but we must make sure what we produce is as unique as the country our domestic game grows within. Using the word "soccer" is a good start. But really using "soccer" is just a way of sending a signal to the rest of the world (and many fans of the game here) that we're through subscribing to the way things were or the way things are. There is only the way things will be. Post-Script: The title of this post is both to make a point (obviously) and a tribute to a now defunct blog titled, "We Call It Soccer". The author of said blog first came up with the idea of the Free Beer Movement, which we now curate.